This title is admittedly a little clickbaity. I’m not part of any athlete biological passport program. For that matter, I never even get doping control tests…. Well almost never. Only once in my four years as a professional triathlete have I had the distinct—um—experience of peeing in a cup in front of a stranger. That was two years ago following a 2nd place finish at the final edition of IRONMAN 70.3 Silverman. Since then, I’ve landed on nine podiums including three wins with nary a test. As far as I know, I’m included in my national anti-doping organization’s (Canadian Center for Ethics in Sport, CCES) National Athlete Pool. In theory, I could get tested at any time. But in practice it only seems to be the athletes in the Registered Testing Pool, those required to submit whereabouts, who actually get tested. This group appears to consist exclusively of athletes competing in Olympic sports, which long course triathlon is not. CCES has evidently decided to allocate their testing budget to Olympic-stream athletes. Ironman also runs an extensive anti-doping program. Professional triathletes’ annual Ironman membership fees (over CAD $1,000) purportedly go towards funding this program. Ironman does not publish separate financials or much information on their anti-doping program, so we have to take any claims at face value. Apparently, Ironman has it’s own internal procedures to flag high risk athletes and assign testing. It’s safe to say that most of the testing is far from random. A quick calculation suggests that if all Ironman’s tests were randomly allocated among prize money positions (top 5-10 athletes), my odds of only being tested once would be vanishingly small. Perhaps I can infer that my performance and trajectory don’t trigger red flags. [pats self on back] For more information, the recent IronWomen podcast interviewing the Director of Ironman’s anti-doping program is an interesting listen. This preamble is not to criticize the CCES or Ironman anti-doping programs. 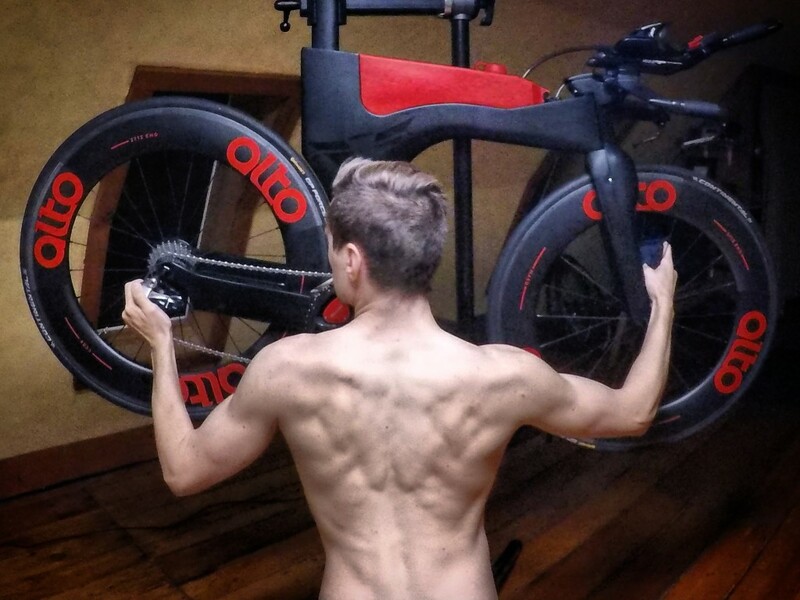 I applaud any efforts to catch dopers, especially by a for-profit organization like the World Triathlon Corporation (WTC), which has no obligation to pursue dopers and arguably stands to gain little from such a program. I wanted to point out how little I get tested to correct some inaccurate assumptions I come across. I’ve shared all sorts of personal data over the years, including a complete history of blood test results. I haven’t been relying on blood testing as much in recent years to monitor health, but I’m still overdue for an update. I share these results first and foremost to maintain the theme of openness and transparency I strive for in my career. Again, this is far from a true biological passport, which would include additional parameters and more frequent readings. Please note how average, unremarkable and sometimes substandard these markers are. A 90s era pro cycling coach would shake his head in dismay at my hematocrit of less than 44%. Things get out of whack when I overtrain, underfuel, get sick or get stressed. In particular, it was a multiyear struggle to claw my way back from pitifully low testosterone levels into the normal range through a comprehensive suite of “all natural” training and lifestyle changes. This is what clean sport looks like. Hematocrit, hemoglobin, red blood cell count, serum ferritin (SF). Definitions for iron deficiency vary, but my sports doctor prefers to see her athletes above 40 μ/L. There are even anecdotal reports of elite athletes experiencing performance decrements below higher SF levels. Through trial and error, I’ve found that I need to supplement one 65 mg elemental iron tablet most days to maintain decent SF levels. I’ve continued to test free testosterone on an annual basis, though results across the years are not directly comparable. The lab switched analytical methods around 2015 from the analog immunoassay (aFT), which yields lower concentrations and has been criticized as unreliable, to the calculated free testosterone (cFT) method. 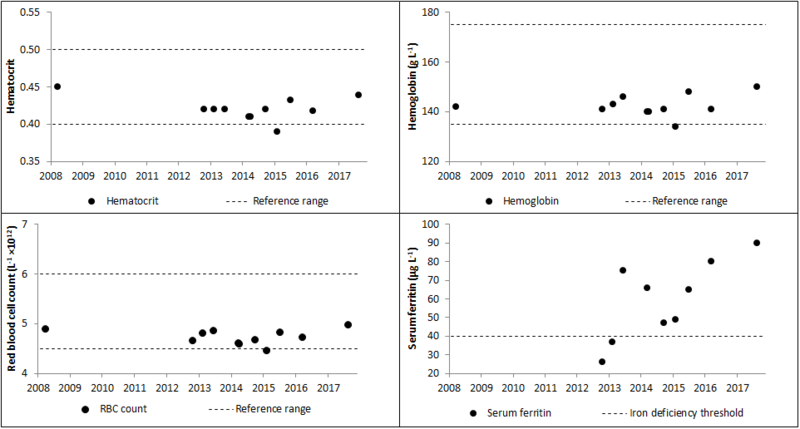 We can still see that my free T levels were previously below the reference range for men 20-39 years of age and more recently fall well within the reference range. And let me tell you, I’ve enjoyed quite an improvement in my—uhhh—drive, performance, mood and physique. Free testosterone (analog immunoassay + calculated methods), luteinizing hormone (LH), follicle-stimulating hormone (FSH). 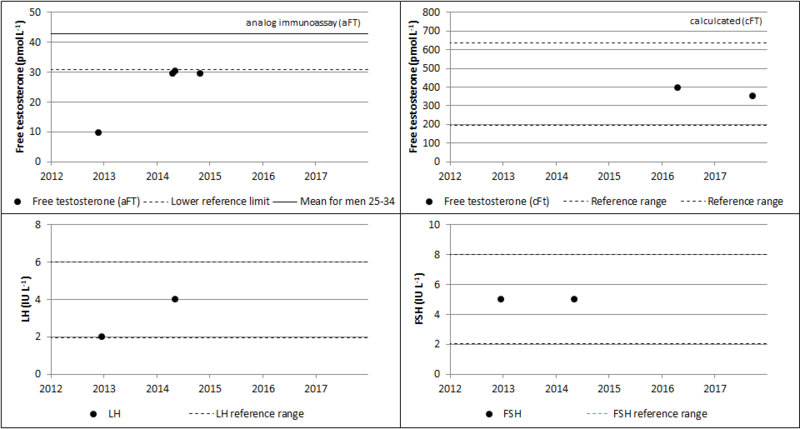 The lab that does my blood work switched methods for analyzing free testosterone around 2015, making results before and after not directly comparable. Not much to see when it comes to Vitamin B12, Vitamin D and thyroid stimulating hormone (TSH). 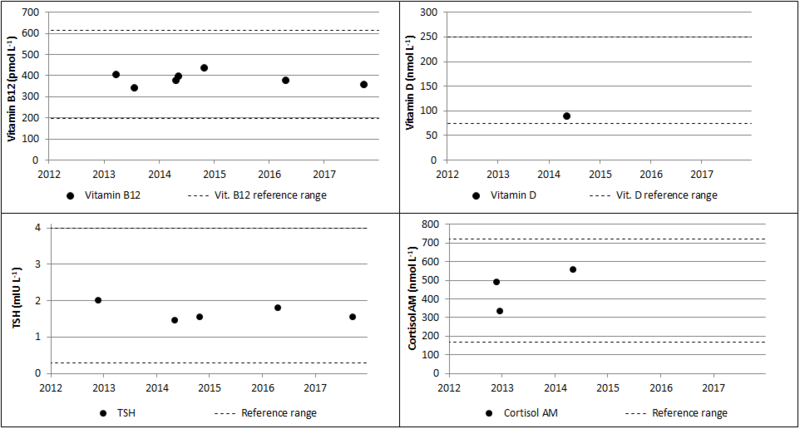 Strangely, Vitamin D is one of the few important markers not covered by the Ontario Health Insurance Plan (our “socialist!” single-payer healthcare system). As I spend most of the year in the dark, frozen northlands, rarely venturing from my STAC Zero pain cave, I supplement Vitamin D over the winter months. I also included approximate weight on the day of each blood test. I don’t pay much attention to weight or body composition these days. In my experience, attempting to deliberately manipulate these variables is playing with fire. I seem to perform best and remain healthiest when I let appropriate training; periodization; and good, consistent, non-neurotic or overly restrictive eating habits dictate my weight and body comp. 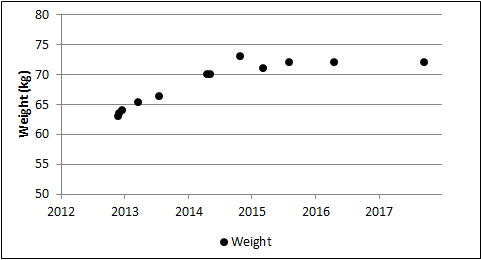 In recent years, my best performances have come around 71-73 kg / 156-160 lbs (at 182 cm/ 6 ft tall). Questions, comments, rude opinions? Fire away on Facebook, Twitter or in the comments below!